I would like to thank you for the treatment my family and I have received over the years at your office. I have come to expect professional and pain free treatment from you and your staff for all our dental needs. I have relied on you for braces for my two children and they are experiencing straight beautiful smiles. I could not believe how utterly painless the last shot I got from you was, before dental work – you are amazing! You can count on seeing my family and me for ALL our dental needs. Dr. Kusumo and Maria are both very efficient and knowledgeable in what they do. Their office is NEVER over crowded because they do not over book like some places we have been to. Although we have another insurance for our children, (they) and we insist on bringing them to Dr. Kusumo. My youngest son is terrified of the dentist, but not when it comes to Dr. Kusumo. Our older son, (now 15) has had to have several extractions in order to get braces put on etc. When this son was 11 yrs old, he had a HORRIBLE extraction experience that should have never gone as far as it did. Up to that point, he was a PERFECT dental patient, so the need for so many extractions now could have been disastrous! Not in this case. Every step of the way, Dr. has been patient, non-aggressive, honest, and most importantly, never makes us feel pressured. As a matter of fact, instead of doing 2 rounds with braces, knowing we are on a very tight budget, he encouraged us to wait, and saved us hundreds, maybe even thousands of dollars. Much like our youngest son, my husband also has a dental/needle phobia. Dr. Kusumo is the only dentist he will see. Trust me when I say, this speaks volumes. 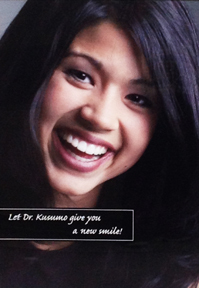 In closing I would like to say, I know we are very blessed to have found Dr. Kusumo and the Remona Dental center. If you haven’t been to see them yet, and are looking for an honest, patient, knowledgeable dentist with the best bedside manner I have ever experienced in ANY medical field, You need to give him a try! You won’t be sorry! I have been a patient of Dr. Kusumo for 8 years. He is my Dentist and friend. He is my Dentist because I know he truly cares about my dental health and well being. Eight years ago when I walked into his office a strong bond was developed between him, his family and my family. He provides quality dental services in a family environment. When I arrive at his office, I am immediately taken care of. It is rare to have to wait in his waiting area for a long period of time. His wife Maria does a fantastic job of using technology to keep me on track for regular dental maintenance and setting appointments, and at times she sends a message just to say hello and to ask about the family. If you are looking for a Dentist that is knowledgeable, caring, attentive and accessible, Dr. Kusumo is the Dentist to see. I am a big guy, but I really hate needles and injections. Especially in my mouth! Ouch! I cringe even thinking about that. I would avoid going to the dentist for years precisely for that reason. Until I met Dr. Kusumo. I really don’t know how he does it, but I have never felt anything when he performed the injection. I have even tried and paid a lot of attention, really trying to feel even the slightest prick to no avail. I cannot even feel the injection! Needless to say I am very happy and that is not mentioning how well he does everything else and how deft he is in performing all the procedures. But for me, the most important thing is that I never felt any pain under his care. I am very thankful that I found Dr. Kusumo. I am delighted with the way my teeth look and feel since you started to treat me. Thank you for doing so with the utmost compassion and skill. I never expected to not have any pain and can truly say that on a scale of 1 to 10 for pain management, I rate you a 10+! I’ll never be afraid to go to the dentist again, if you are my dentist. I travel at least two hours each way to get to your office and I feel it is well worth it for I am in your good hands. I have been a patient of Dr. Kusumo for over 5 years. Not only is he an amazing doctor, but also an awesome person. In every decision that I have had to make regarding my teeth, he has helped me to make the right decision with MY best interest in mind. I feel so very blessed in finding a dentist who is fair, helpful and caring. I would like to thank Dr. Kusumo and his staff for their impeccable patient care and dedication to their clients. I have always found them to be very professional with a personal touch to their service. My family has enjoyed the care we receive, and we respect Dr.Kusumo’s advice. I have used him for many different services over the last ten years and would highly recommend him to anyone looking for excellence in overall dental care. Like many others, I have to grit my teeth to go to the dentist’s chair. But your apprehension will be reduced with a visit to Dr Hadi. I chose Dr Hadi for my last visit to the dentist. From the moment, I stepped into the clinic I was put at ease by his wife, Maria. Dr Hadi’s steady hands and long experience as a dentist helped me with the dental work I needed. His clear explanation of what was needed for my teeth was reassuring, to say the least. The visit was quick, and relatively painless. Dr. Kusumo and his assistant Maria have been nothing but wonderful, generous, gentle and very caring in all ways. This gentle, kind man is always caring about what he does and the kindness involved. I would never consider anyone else for my down syndrome son, who usually screams or needs to be put out. With Dr. Kusumo, my son sits quietly and watches television while the procedure is done. It is a joy to see my dentist, Dr. Kusumo and Maria. I very much recommend them in all ways. Over the last 40 years the mere thought of going to the dentist has always sent cold chills down my spine. This is the result of dentists in the past that were too rough and just treated the tooth and not the entire patient. But then I met Dr. Kusumo. From the moment I spoke to his staff on the phone and the way they put me at ease to the time I met him my experience was very different. Walking into his relaxing office and being seen on time, instead of waiting for hours, avoided all the negative feelings and anticipation. His kind and gentle personality and his ability to teach me about my treatment options allowed us to decide what was the best for me. What a relief, I was ready and relaxed before I even sat in his comfortable chair. The treatment was flawless and he was so gentle that it was like brushing my teeth. No pain, No spine chills, No skull vibrations or nasty smells. I actually watched a movie on his in room monitor and did not miss a line. At last I have found a dentist that I look forward to seeing and that means I get the treatment I need now and will never put it off again. Thank you Dr. Kusumo and staff. As long as I can remember I have always feared having to visit the dentist. At least that is until I met Dr. Kusumo and his wife Maria. They are really just two of the nicest, sweetest, patient, most genuine people I have ever met. I’m the type of person whose really big on first impressions and the two of them passed with flying colors. For years, I had been going to the same dentist and he’s all I knew, but because of a recent move I had but no other choice to look for another dentist. And of course, as one would imagine I was a little bit apprehensive about having to find another dentist just as good and just as trustworthy, but never would I have imagined I’d find someone like Dr. Kusumo who is hands down ten times better than my previous dentist. The first time I had met with Dr. Kusumo he kindly outstretched his hand and introduced himself with a warm and welcoming smile. Almost instantly, I felt a huge sigh of relief overcome me and the lingering feeling of nervousnes! s vanish. Call it instinct, but I knew right then I was in good hands. 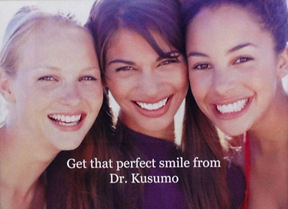 Dr. Kusumo is the right choice for a dentist. I can almost guarantee you will not be disappointed. I wasn’t. Do you know anyone who actually likes going to the dreaded dentist? Well, I didn’t always. Throughout my life I liked the dentists alright but that didn’t make up for the uncomfortable nervousness and butterflies that I would inevitably feel. I actually didn’t know that Dr. Kusumo and his wife Maria could do anything differently to assuage this discomfort but they did and that’s why I volunteered to write this little piece. Dr. Kusumo did some beautiful dental work, offered to help me in any way he could and laughed at my jokes. He invited my input into the best way to proceed with the multitude of work I needed to have done but first he explained everything in detail so I’d be able to make intelligent decisions; I liked that. Maria provided warmth, charm and also laughed at my jokes! These two people are caring number one, professional, efficient and take you in as family not only for financial gain. You’ve read up to this point so you’re probably interested in going to the dentist I described here. , If what I’ve said isn’t true then you have nothing to lose; there is no one else that matches this description that you know of, is there?